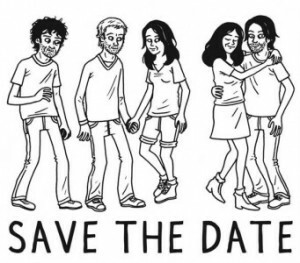 ‘Save the Date’ follows a bookstore employee and illustration artist Sarah (Lizzy Caplan) who is dating a musician Kevin (Geoffrey Arend). Sarah is a bit skittish about moving in with Kevin and on the first night she moves in, she tells him all the reasons she is going to be a terrible roommate. Hoping that her warnings will change his mind about living together, we clearly see she has commitment issues. Sarah’s sister Beth (Alison Brie) is engaged to Kevin’s band mate Andrew (Martin Starr). The two of them are knee-deep in planning their wedding. Kevin, inspired by his friend’s relationship, decides to propose to Sarah in front of the entire audience at one of his band’s upcoming performances. The awkwardness of this scene was almost unbearable. I literally buried my head in my hands when he started to propose. I just couldn’t watch. Needless to say, the proposal goes horribly wrong. Sarah flees, leaving poor Kevin embarrassed in front of everyone. She moves out the next day. One of Sarah’s bookstore customers by the name of Jonathan (Mark Webber) has had a serious crush on Sarah for a long time. Witnessing the botched proposal at the concert venue, he swoops in to take advantage of Sarah’s emotional turmoil. Jonathan, the nicest and sweetest guy in the film, is more than happy to be Sarah’s rebound so long as he has the opportunity to try to win her heart. While all of this is going on, Beth and Andrew are dealing with wedding planning with Beth being a “Bride-zilla”. A few unexpected twists and turns confront Sarah and Beth that will challenge them both and help them develop a more mature outlook on life. Caplan, Webber, and Arend go beyond the typical silly comedy routine and show an amazing emotional range in their roles. Their acting allowed me to enjoy the film more than I should have. Although a few of the characters are borderline narcissists, they all have redeeming qualities that make you care for each one. I’ve seen this same story a million times before, and while director Michael Mohan has a stellar cast and some interesting plot techniques, ‘Save the Date’ runs out of steam and fizzles out way before it’s finished. This entry was posted on Tuesday, April 17th, 2012 at 3:34 pm	and is filed under Film, News. You can follow any responses to this entry through the RSS 2.0 feed. You can skip to the end and leave a response. Pinging is currently not allowed. « Bryan Reviews ‘Cinema Six’!! !